Young Taylor Romeo scored for Phantoms at MK Thunder. 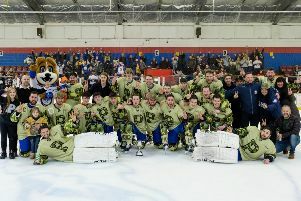 Peterborough Phantoms took command of their NIHL Division One South play-offs quarter-final last night (March 23). The city team eased to a 7-3 success against Milton Keynes Thunder in a first leg clash in Buckinghamshire. Young Jarvis Hunt scored for Phantoms against MK Thunder. And sealing progress into the semi-finals should now be a formality for league runners-up Phantoms, who picked up a whopping 41 points more than their second-bottom opponents during the regular season, in the second leg at Planet Ice tonight (March 24, 5.30pm). “It was a good performance from the guys to start the play-offs in the right manner,” said Koulikov. “We have put ourselves into a great position and we were good value for the four-goal lead we built up. “We played really well offensively and it was good to see a couple of the young guys get among the goals. An early flurry of goals gave Phantoms the advantage as Martins Susters, Taylor Romeo and Will Weldon all struck in the space of three minutes and 16 seconds during the first period. James White then added the only goal of the middle session before Jarvis Hunt joined fellow hot prospect Romeo on the scoresheet by lighting the lamp early in the final stanza. Thunder hit back with a short-handed goal from Trevor Leblanc before the two sides shared four goals in under a minute late on. Ales Padelek launched that frantic spell before Joe Edwards replied for the hosts. Player-coach Tom Norton then struck a trademark powerplay goal to complete Phantoms’ tally, but Logan Prince hit back only nine seconds later. 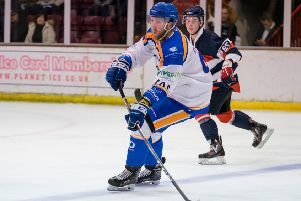 In other first-leg clashes last night champions Swindon thumped basement boys Invicta 11-1, third-placed Basingstoke won 5-2 at sixth-placed Streatham and Bracknell drew 1-1 at Raiders.